Check into your hotel, then the rest of the day is free to explore on your own. This afternoon, meet your Tour Director and fellow travelers, and prepare for your upcoming spiritual journey. Welcome dinner at your hotel. This morning travel to Lucerne, a picturesque town built along the shores of a shimmering lake and at the foot of majestic peaks. Spend some time visiting the town center and take advantage of the optional excursions available. 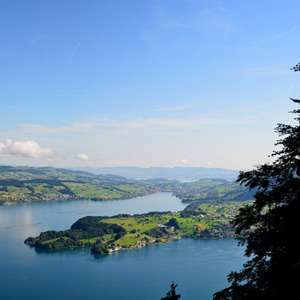 In the afternoon, visit the BENEDICTINE ABBEY OF EINSIEDELN, a major station on the Way of St. James and one of the most important pilgrimage sites in Switzerland. Visit the magnificent Baroque Monastery and Chapel that is home to the BLACK MADONNA, made out of black marble. Spend some time in prayer and then celebrate the Divine Office Vespers and the Salve Regina, before returning to Zurich. Leave Zurich and travel east to cross briefly into Austria, skirting scenic Lake Constance, and continuing into Germany through the farmlands of Bavaria and the alpine landscapes of Oberammergau, where in 2020 the once-a-decade Passion Play will take place. This performance is staged every 10 years since 1634 when it was initiated as an oath to give thanks for the village having been spared from the black death. Visit the THEATER where the Passion Play takes place. Stop in Munich, the capital of Bavaria, for a short visit of the city center to admire Marienplatz with the Glockenspiel (carillon) of the new city hall tower. Head towards ALTöTTING, spiritual focal point of Bavaria for more than1250 years. Here, enjoy a guided visit of the old town and the PANORAMA MUSEUM, a stereoscopic painting (large scale panorama) created in 1902 portraying the holy city of Jerusalem. Join the evening Mass and the candlelight procession, ideal moments for reflection and worship as well as for sharing your sense of faith with other believers. 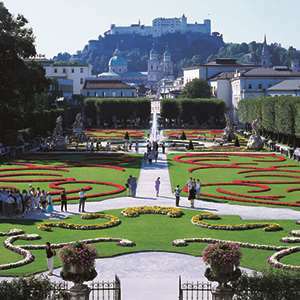 Spend the morning getting to know picturesque Salzburg, Mozart’s birthplace. Try the famous marzipan pralines, take a walk in the old town, listed as a UNESCO World Heritage Site or step into the Cathedral for some prayer time. 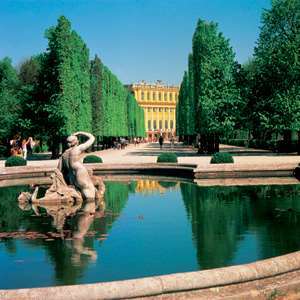 In the afternoon, travel to the imperial city of Vienna, built along the banks of the Danube. On the way, stop at the baroque MELK BENEDICTINE ABBEY, an important intellectual and cultural center over the centuries. Discover the capital of waltz on a guided city tour today; learn about the Habsburg dynasty that ruled the area for centuries, and see some of the finest buildings that give the city such an elegant feel: the State Opera, the Parliament, and the former imperial Hofburg palace. Later, if you wish, you can celebrate Mass in the solemn CATHEDRAL OF ST. STEPHEN. 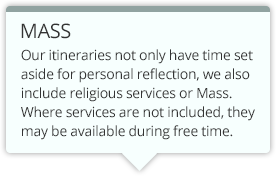 Continue exploring at leisure, or join an optional excursion. In the evening, say farewell to your newfound friends during the included dinner at a local restaurant. You certainly shared some really intense faith experiences but also some unforgettable moments of joyous communal life.